It was once the highest Bungy Jump in the world! 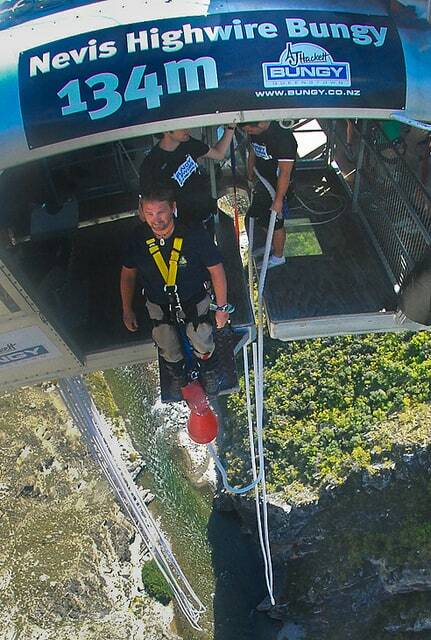 It may have lost its title to China, but the AJ Hacket, Nevis Bungy Jump in Queenstown, New Zealand is no less thrilling! At 134 meters, this is a monster of a Jump. Getting there is part of the thrill. The 40-minute drive from Queenstown takes you to a steep and winding access road. Once you reach the turn-off, the journey goes up a private mountain access road. To make the jump more terrifying, you have to take a cable car out to the centre of the gorge where you jump from another cable car dangling high above the river below. Your guide will clip you into the tiny moving box as you make your way out to the jumping platform. When you arrive, the music pumps loudly as you walk over the transparent floor showing the valley below. To add to the terror, they prop you up on a see-through shelf. You sit on a bench staring into the abyss below while they strap your legs and joke and laugh with you. Is this your first time trying a bungy? Ah you'll love it, they say. But all you can think is “What the hell am I doing up here? Your time has come and they have you cross the line to the “non-safe zone” where you are plopped into a barber's chair. Your mind can't focus on anything as they strap your legs to the bungy. But you have to concentrate because you need to know what to do once the jump is over. You said What? I have to pull the rip cord on the second bounce? I doubt reaching up to pull a cord off my legs as I flail through the air will be the first thing on my mind. Oh well, I'll give it a shot. 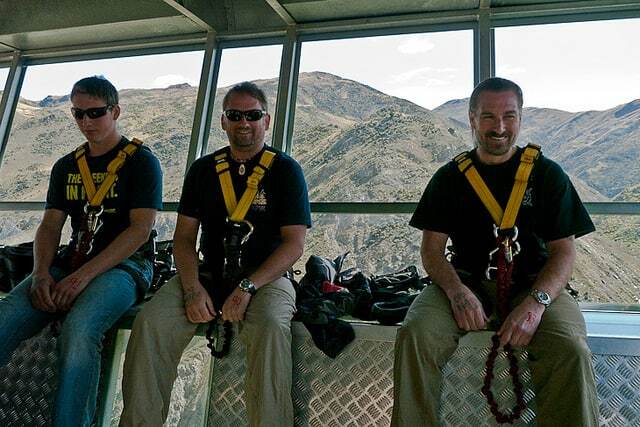 The Flying Kiwi was kind enough to book the Nevis Bungy and the Swing. Our Flying Kiwi travels through New Zealand have been one thrill ride after another and the jump from the Nevis will be difficult to top. 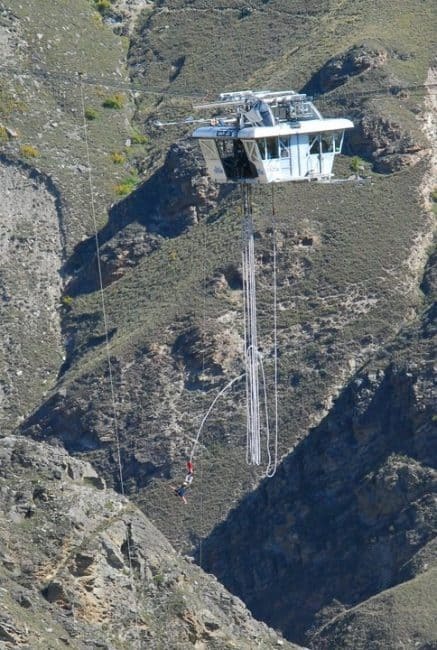 For adrenaline junkies and adventure seekers this is a must do for anyone stopping in Queenstown on the South Island. New Zealand is definitely living up to it's reputation as the adrenaline capital of the world. There is no explaining what it's like to jump so we will let the video speak for itself. I highly recommend buying the video and photos from AJ Hackett, they are very pricey, but for this once in a lifetime opportunity it is worth the $130 New Zealand Dollars. (approx. 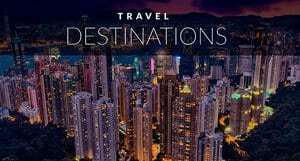 $100 Canadian dollars for video and photos of both Bungy and Swing provided on a USB card. Bungy only on a disk is cheaper prints are even cheaper. 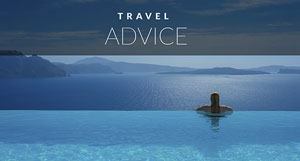 The cost to jump is $260 New Zealand Dollars. The prices are steep, but Ajay Hackett has an impecable safety record. They spend money to keep equipment updated and beyond safety standards and the cost of leasing an entire canyon must be astronomical. We at first thought it was a cash grab until talking to several locals about it. The market can definitely bear it as bus load after bus load of people arrived at the jumping area. Nobody seemed to mind spending the money on this adrenaline activity. 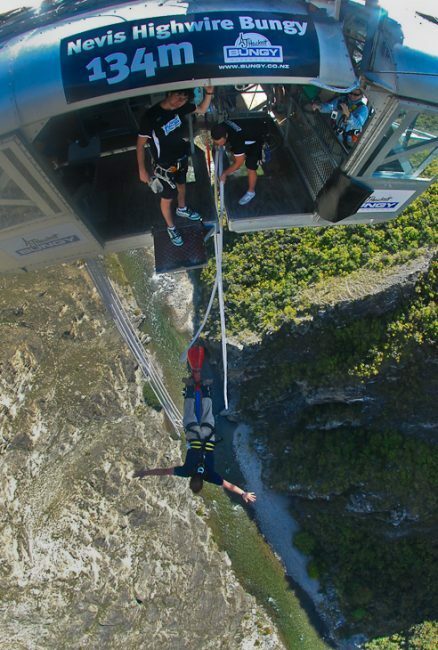 31 Responses to "Bungy Jump in Queenstown, New Zealand – Video"
Wait…. you have to pull a rip cord after the second bounce?? Why? What happens if you don’t? That sounds like some serious responsibility to handle when you’re bouncing around in the air, lol. This is completely insane! Bungee jumps are one of those things that are so easy to talk about doing, but when you actually think about it, standing on the edge and looking down, suddenly it becomes a terrifying thought. 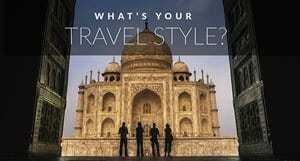 Would love to do one, but might need some Dutch courage! 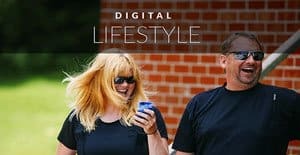 Hats off to Dave – he’s a braver man than me! He is braver than me too. I have no desire to bungy jump and I don’t know if I ever will. It is just something I can’t make my brain say yes too. 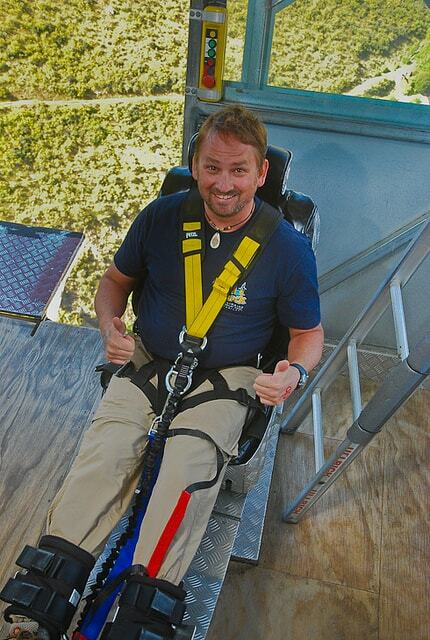 Skydiving is okay, bungy is freaky. I would not have the guts to do this! My girlfriends daughter just did bungee jumping in New Zealand and I watched her video and say pictures. NO Way Jose! Looks like you enjoyed it though! That would have sucked having to have your head down. It helped to have to look up into the camera. Ah yes, you pull the rip cord now. It is much more civilized. Except you have to pull it yourself on the second bounce to make it come off. fun! Hey Bjorn, I listened to the music and concentrated on that. It helped a lot. Yeah, I guess any distraction at that moment would help… I liked the guy who was trying to keep things lighthearted and jovial right before the big jump:) Quite the talent set! I think that is a pre requisite in the interview process. You better have sarcasm and whit to distract the terrified souls that are about to jump. “What the hell am I doing up here?” — LOL. It looks terrifying even from the pictures. And the perspectives on your video cannot make it look even more terrifying, haha! Must have felt great when you guys finally made the jump though! That looks terrifying. I would rather jump out of an airplane than go bungee jumping. On a recent trip to Costa Rica I did a Tarzan swing thing, which involved a 40-meter free fall, and that was scary enough, but I’m really not sure I could jump 134 meters. Did Deb jump too? Good for you for doing the tarzan swing. The Swings are just as exciting. Deb didn’t jump. She is like you, a skydive is fine, but not a bungy. The paragon of undertasdning these issues is right here! That is exactly what I did. I was the camera man. But AJ Hackett did such a great job with photos, I wasn’t even needed for that. I went out there with Dave and was nervous just watching. I can’t step off a bungy either. I am trying to work up the nerve one day, but for now it is just Dave that does the jumps. I’ll do anything else. Just please don’t make me bungy. I am going to practice jumping off the high dive at the public pool:-) baby steps I say.